Drawing of flat yam to produce various fancy qualities of yams. 1.Easy to operate, each person can operate 2~3 , improve work efficiency. 2.The use of brake motor and speed control frequency converter, Winding speed can be adjusted. Change of Technical Structure in Traverse CAMEven winding type by the fixed distance of traverse feeding, Lengthening the lifi of CAM by lower tension of traverse spring. Textile Winder are "CE Marked". Textile Winder have different features which varies according to the requirement of the customers. The basic difference is in the no of bobbins and the weight of final package. The textile winder are of high speed, capable of winding 5000mts to 40000mts. we are control panel manufacturer and very pleased to provide you information about cheese winding machine (individual groove winding motor) control panel. we are hoping to work with your very prestigious company. cheese winding machine (individual groove winding motor) control panel. 1) position panel (4 positions in one). 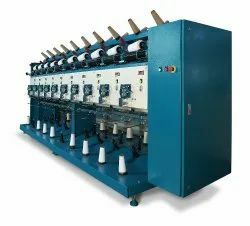 This machine is used for winding threads.